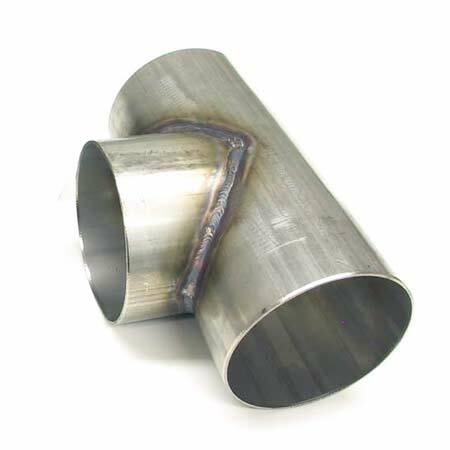 Tee Pipe for VES attachment, Welding into original exhaust pipe required, specify 2", 2.25", 2.5", or 3". The VES system is a system that works “on demand” at the onset of boost on turbo and supercharged vehicles to free up all the backpressure (just as a large exhaust system would) in the exhaust stream so the engine can make maximum power. The VES system works as an active dump tube that completely bypasses the restrictive exhaust system when boost is present. As soon as the turbo spools, the valve begins to open. By the time the turbo makes full boost, the valve is fully open. Completely quiet and stock-like sounding during startup, idle, and cruising. 0 delay in valve response to boost, yet very smooth transition into boost mode. Automatic open/close under boost using existing boost source on turbo engine and does not rely on wing nuts or electrical motors. Integrate a boost controller to control when the valve opens or completely turn it off. Addresses virtually all complaints associated with large 3” cat-back exhaust systems. Solid billet steel construction holds up to high (turbo) temps and won’t fatigue and fail in continuous heat. Precision CNC machined to tighter tolerances for a gasket-less seal. Built using existing, reliable wastegating technology. Standard valve built to accept most common actuator bolt patterns for wide range of spring pressures.